RYANAIR has scrapped a plan to introduce flights between Almeria and Liverpool, after the tourist board backed out of supporting the route. Ryanair spokesman Stephen McNamara has expressed his criticism of the move, saying it could result in ‘the loss of ten thousand British tourists, and nine million euros to the local economy’. 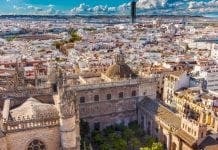 He accused the Almeria Tourist Board of putting its largest source of revenue – tourism – at risk. Local restaurant owner John Beachcomber, however, believes Ryanair is trying to force Almeria into paying expensive subsidies to the airline – by threatening to instead run services to the soon-to-open Corvera airport in Murcia, 180km away. “I bet this is the usual bully boy tactics from Ryanair,” said the Englishman, who runs a restaurant in Mojacar. In May 2010 Ryanair cancelled 28 weekly flights to Granada after the city hall stopped paying special subsidies to the budget carrier. Not saying he is wrong but who exactly is Mr. Beachcomber ? Is this new style investigative journalism ? Ask your local barman for his valued opinion ? are just trying it on. They like gettimg it all their own way and they also put the blame someone else. Why does Ryanair find it so difficult to run a business without having to rely on subsidies. Why can’t they just run a service with reasonably priced return flights based on properly researched passenger numbers instead of these Mickey Mouse €1 flights with additional charges piled on top. We booked flights with ryanair to almeria and then they just casually e mail us that its all off. Booking the flights was a trauma compared to any other airline,they really don’t care for human beings. Abad Yolk, Who better to have a slant on the results of O’Leary machinations? A local tourist-based business is going to have a better overview than a parachuted- in journalist. No offence O.P…..
Well, if Granada didn’t feel the need to keep the tourists coming, it was their loss. It must have cost them millions in lost revenue. Ditto Almeria. Don’t blame Ryanair, blame short-sighted councils if they aren’t willing to help sustain these routes. I laugh when I remember the tourism minister in Jerez saying he wanted ‘more up-market tourists’. Now they’d be glad of the Ryanair visitors who they also lost last year. They got what they deserved .. it’s just sad that ordinary hard-working people lose out because of stupid politicians and their arrogance. PS James … sympathy and everything, but try booking with BA instead. They’re really caring. And much cheaper? Don’t think so. how can Almeria afford to run a tourist business without tourists? I am staggered at the fact NO airline now flies from Northern England airports to Almeria. Almeria doesn’t want a tourism industry, clearly. Clever eh? These pro-Ryanair views are astounding, do you people own shares in the company? The mooching for subsidies is nothing short of blackmail. As any fool knows, giving in to blackmail simply leads to more and higher demands. An airport is a facility. Like a hotel for instance. Imagine asking a local council to subsidise your stay there on the grounds that you will spend money locally. A flea in the ear would be the least of it. Budget airlines should stop ducking and diving with their costs and simply charge us, up-front, with the bottom line. If that includes a payment to an airport, then so be it. We’re adults, we can understand these things. I am not a lover of Ryanair however we could look at this from another point of view. In my experience Ryanair seem to be the cheapest around, although I am not in favour of their hidden charges, but they still appear to come out cheaper. Perhaps this would not be the case if they did not receive the subsidies ! So in a way the traveller does benefit financially. Donald Marshall: It’s all smoke and mirrors. The subsidies for Ryanair come out of the particular council concerned. They have to make the money back by stinging local business, who pass the charges on to the punter. Us. Where is the benefit? It’s in Ryanairs jingling pockets. Stefanjo: What about Ryanair prices versus EasyJet or Jet2 for that matter, their prices are constistantly higher than Ryanair. What about their profits, do they get the subsidies from the local councils which add to their “jingling pockets”? Probably not. Therefore if we look at the flight prices alone we probably need to conclude that these subsidies do in fact subsidise Ryanairs fares, why else would their flight prices be consistantly cheaper. The services do not vary much other than the Easyjet carry on allowance.